Microsoft unveiled a major refresh of the Windows Live Essentials suite. The video overview focuses primarily on the improved photo editing, management, and sharing features--which do seem fairly impressive. But, small and medium business customers will be much more impressed with the expanded features and functionality of Windows Live Mail. Microsoft has powerful spam filtering protection, and additional innovations in place to proactively combat junk mail which help business professionals cut down on Inbox clutter. However, just the legitimate messages that are supposed to be in the Inbox can create a clutter of their own and make it difficult to communicate efficiently. When you log in to Windows Live Mail, the Highlights feature enables you to immediately see if there are any new messages from your contacts, social network updates, or appointments and reminders. The 1-Click Filter in Windows Live Mail lets you filter your view of the Inbox to show only unread e-mails, or only messages from your contacts, or only messages from designated social networks like Facebook and LinkedIn. As the name implies, this filtering is accomplished with a single click. 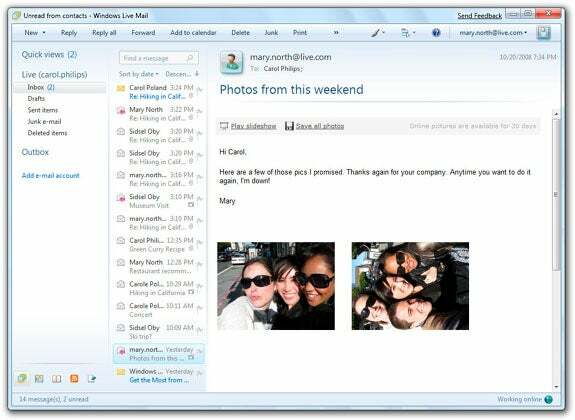 Windows Live Mail also provides Quick Views which let you sort messages from your Inbox and all folders based on which ones contain photos, documents, videos, or messages that you have flagged. Conversation threading makes it easier to follow a message thread from beginning to end, and Windows Live Mail also includes the ability to quickly retrieve the entire history of messages from a given sender. The Sweep feature automatically declutters your Inbox by moving conversation threads to an alternate folder, or deleting them entirely. The new Windows Live Mail incorporates some aspects of unified communications and extends mobile access to communication. Instant messaging, SMS messaging, and social networking are all integrated into the app. You can instantly see which contacts are available online, and initiate an instant messaging chat session, or send an SMS text message to the contact's phone without leaving the Windows Live Mail Inbox. Using Exchange ActiveSync technology, the Windows Live Mail software can push e-mail messages to your mobile phone. You can automatically update and synchronize your e-mail, calendar, and contacts between your smartphone and the Web. There are also custom apps available for BlackBerry, Nokia, and other mobile phones that don't support Exchange ActiveSync. Windows Live Mail is also tightly integrated with Office Web Apps, and with Windows Live SkyDrive to enable online viewing and editing of Microsoft Office documents. Windows Live Mail preserves the formatting and appearance of Office docs, and files can be e-mailed to and viewed on alternate platforms like Gmail and Yahoo! Mail. The list goes on. Cloud-based applications and services are not Microsoft's forte--those are Google's stomping grounds. Microsoft is playing catch-up, but this latest refresh of the Windows Live Essentials seems to do an impressive job of catching up. The features and capabilities of Windows Live Essentials, and specifically Windows Live Mail, deliver remarkable functionality for small and medium businesses looking for an alternative to Google for cloud-based services. And, Microsoft has better integration and fidelity with the desktop version of Microsoft Office, which can be a compelling feature.